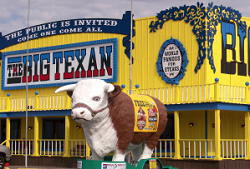 The Big Texan is a famous spot along Route 66 with one of the all-time great food challenges: Finish their seventy two ounce steak and you get it free of charge. You can identify the place by the saloon style architecture, the windmill and the big bull outside. You’ve probably seen the Cadillac Ranch in movies and photos. It’s the place along Route 66 where all those busted up Cadillacs are planted nose-first in the ground at a Leaning Tower of Pisa angle. A beautiful place to take in a sunset or pose for some photos. 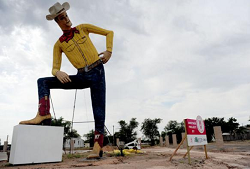 Tex Randall, the other Big Texan, is a cement and steal statue of a cowboy found in Canyon, TX, standing forty seven feet tall in a leisurely slouching position. Very, very, very tall dark and handsome, you could say that Tex Randall is one of the seven manmade wonders of the American Southwest. Barney Smith’s Toilet Seat Art Museum is just what you’d guess: A museum of toilet seat art. 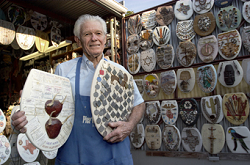 The museum contains 1500 hand-painted toilet seats, each telling a story of American history and of Barney Smith’s life. The humble museum is run out of basically a big garage, it has a rustic, hand-made charm to it that you’ll only find on a Route 66 road trip. “Why I wouldn’t pay a wooden nickel for that!” you may say… but hold on a second, some wooden nickels are quite precious! 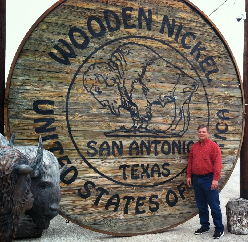 The museum, found in San Antonio, features a wide range of wooden nickels, including the world’s largest, standing 13 feet tall and weighing about one and a quarter ton. And yes, we placed this one fifth on purpose. 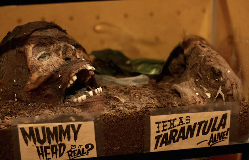 The Museum of the Weird can be found in Austin, where you’ll see the tradition of the dime museum carried on with mummies and shrunken heads and “freaks of nature,” being bizarre works of taxidermy. The Museum of the Weird will take you right back to the days of P.T. Barnum, when they used to run weird freak shows and show off strange oddities in hopes of getting your hard earned nickels and dimes. Austin can get a little congested at times, so it might be a good idea to visit the museum on a week day in order to beat the weekend traffic. The American road trip is a dying tradition in the age of Uber and Internet. Why go anywhere when you can look up some videos, why drive when you can pay someone to take you there? Maybe that’s better for the environment, it certainly results in less traffic at rush hour, but all the same, a whole world of American culture is dying off. 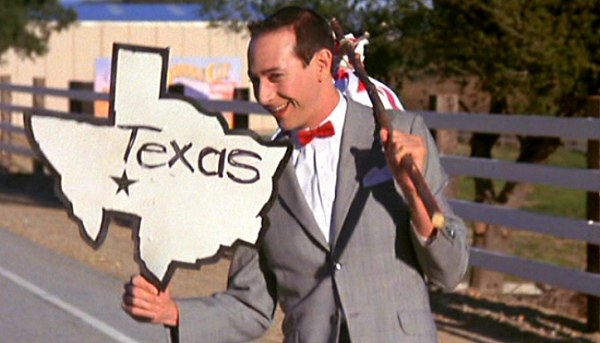 So much of Texas history is found not in the museums, but on the highways.